I’ve got both a cold and an awesome mom who’s playing with her grandson in the other room. Lying under the covers earlier this morning to feel the benefit of my Vapo-Rub-smeared body, I was reminded of the awesome canopy bed I had as a young teenager. Although the white four-poster with white eyelet fabric didn’t last more than a few seasons (a combination of dust and the changeable tastes of a teenager), I remember it fondly. 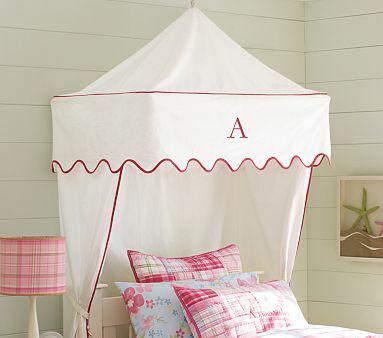 And as with many mid-80s trends, the traditional canopy bed (seen above) seems to gone the way of the e.g. smith scrunchie sock. Inspired by a photo in a previous post (the perfect 4-poster with tie-on-drapes), I decided to check out what’s taken its place. 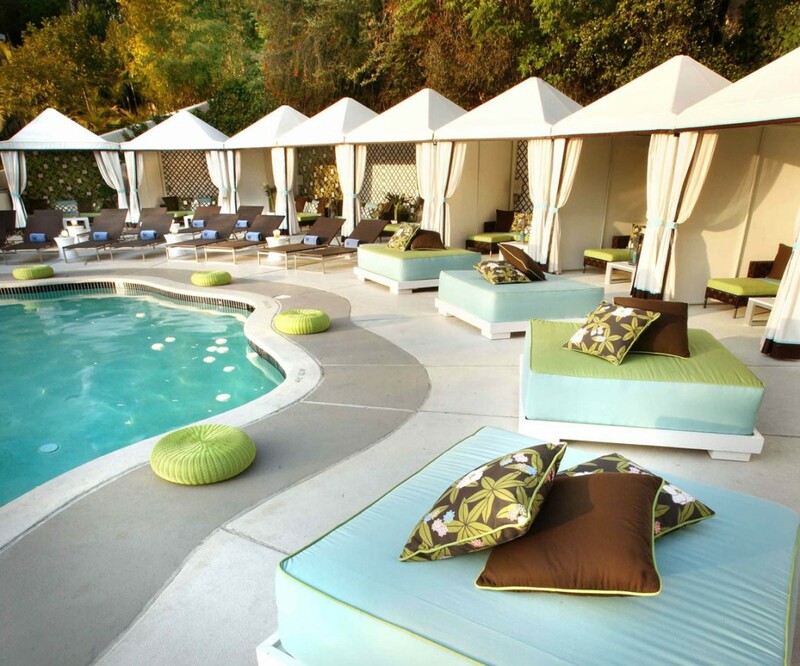 Poolside room service is nice. 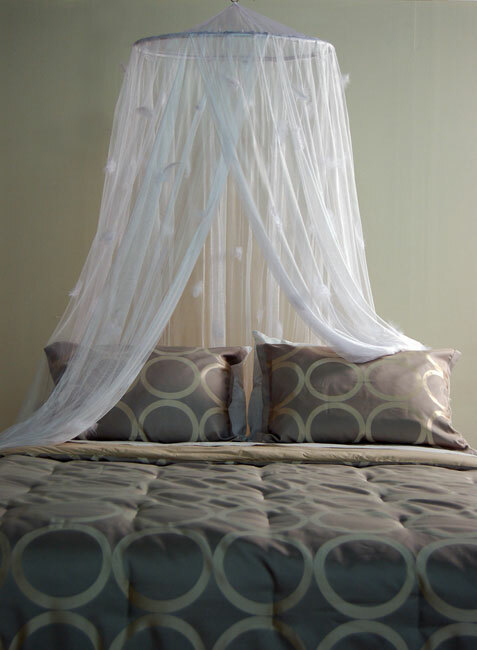 I really love the look of this feather-adorned netting, although after having once spent a week in Southern India (where mosquito nets are more functional than decorative), the whole idea of them kind of skeeves me out. Personally, I’d half expect to find bugs staring at me when I awaken, and that’s not a recipe for sweet dreams. What a fantastic idea. Jonathan Adler hung curtain rods from the ceiling, then used ordinary drapery/curtain panels to create the surrounding canopy. 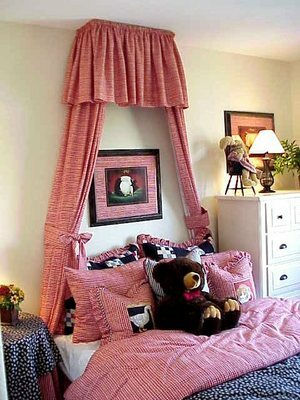 I probably wouldn’t advise using this technique for young children’s rooms (you don’t want anyone hanging from ceiling-mounted curtain rods) but it’s just such a creative and fantastic idea for an older child. The entire house is incredible – there are more photos on the House Beautiful link above. Are you handy with a sewing machine and staple gun? If so, the folks at About.com suggest the following: “You can make this dramatic canopy by stapling fabric to a board mounted on the ceiling. 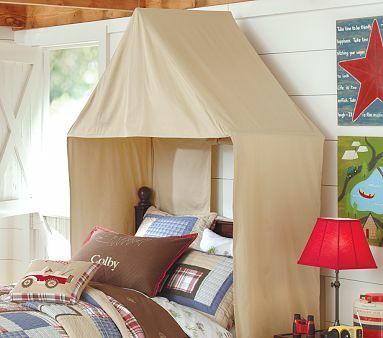 The tie back curtain panels can be lined with plain white lining or you might choose a coordinating print that peeks out for contrast.” What’s great about this version is that you can coordinate your sheets/bedding with your canopy and create a true centerpiece to any bedroom. Lastly, after nearly finishing this post, I found an article on Apartment Therapy (of course) with some additional options. 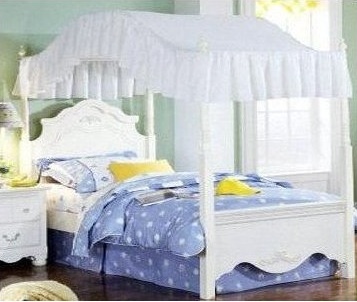 They are almost all four-poster frame beds; one commenter suggested that the mere suggestion of a canopy is enough. But I’d still prefer the curtains.